The annual community wide garage sale will be held on the first Saturday of June; this year it’s June 2 from 8 AM to 12 noon. Signs, advertising & maps will be provided, free of charge. The deadline to be on the map is May 30. 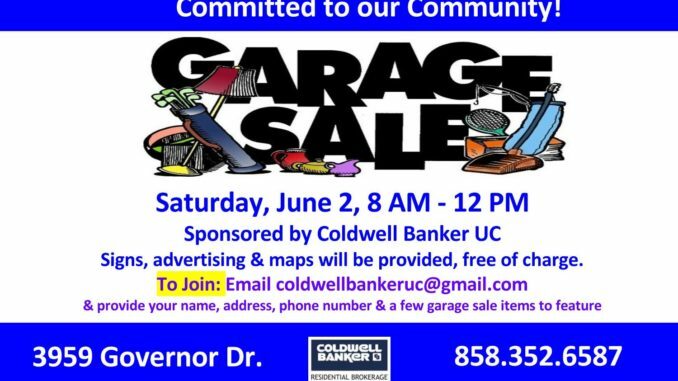 Maps and garage sale addresses will be at Coldwell Banker in University Square (VONS Center) at 3959 Governor Drive, starting at 7 AM on June 2. Please contact us to include your home garage sale in this huge University City event. To sign up, e-mail us at ColdwellBankerUC@gmail.com with your name, address, phone and a few of the items you are selling. Set up your “store” the night before. Cover up or put away any items in your garage that are not for sale. Tag all items, but be prepared to haggle. Make sure appliances work. Clean/dust everything you can. Have lots of coins and small bills handy for making change. Use a “fanny pack” to carry your money around with you. Don’t open the door until you are ready for business. Be prepared for early shoppers. They are the pros. Remember the maps go out at 7 AM on June 2.